I saw this on a post on the iATN website and really liked it! Coupled with any probe from Jumperkits, this makes a great tool to have in your box! Just crimp a couple of male spade terminals onto the bulb leads, and you can connect any probe found in a Jumperkit! Here’s the ling to the post on iATN. 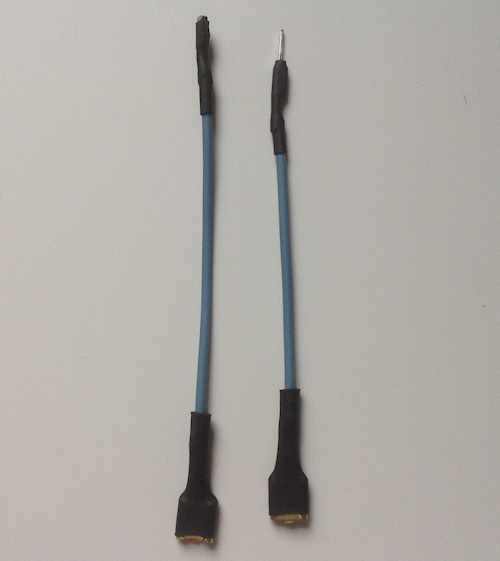 Today we start offering the square Micro 64 probes that you have been looking for! These are Tyco terminal part numbers 963716-1 (male) and 963715-1 (female). The male pin measures .64mm. Corroded terminals can be easily identified by disconnecting the connector bodies and carefully examining the pins and sockets for any corrosion. Any terminals that show signs of corrosion should be replaced. Pushed back pins or sockets can also be found through visual inspection and also require replacement. Sometimes the cause of the loose terminal may be a worn out body, rather than the terminal itself. If this is the case, replace the connector body and any required terminals. If nothing is visibly wrong, poorly mated, loose, or worn out terminals can be discovered by performing a “drag test” using the correct wire from our Jumperkits. Select the correct mating terminal from the Jumperkit and manually insert it into the terminal in the connector. As you slide the terminal in and out, it should fit securely and you should feel a significant amount of “drag”. If not, the terminal should be replaced. We've recently made some changes to the site to provide a better integration experience when paying with PayPal! We were seeing a lot of problems when an address entered on Jumperkits did not pass the validation process used by PayPal. Now you be able to modify the addresses on the PayPal site instead of the order just being totally rejected by PayPal. As part of this improvement, and to be better able to service our customers, you now have to register on the site before you can check out. There is no more "guest" checkout allowed. Were sorry for this initial inconvenience, but registering provides us a way to better assist you, and there are also benefits for you too. As a registered user, you can see your past orders, you can save a cart for checkout later and you can re-order from your history! For a while now we've been wanting to offer some other complimentary items for sale on our site. It's taken some time to work out the details, but we're almost there! Soon you will see additional products that we think go along well with our Jumperkits. Things like terminal release tools and fusible DMM leads. As we add these products, we hope that you will find our pricing competitive and enjoy the "one stop" shopping that we hope to provide. Stay tuned for more! Sign up for our newsletter by registering on the site. Well be sending out the new product announcements soon. 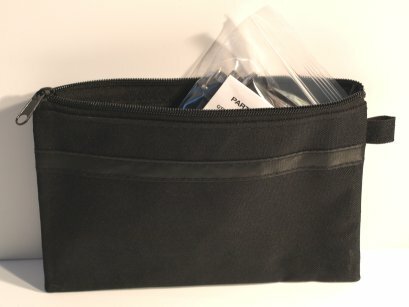 We've added a new optional pouch to store your Jumperkits. It's a zippered, heavy duty nylon pouch that will hold up much better than the plastic zip lock bag the kits are currently packed in. Sometimes the pins poke thru the plastic bag, and once it’s ripped, the wires start to fall out! This rugged nylon bag that will hold up well even when tossed into your tool box! This great bag will help protect the Jumperkit wires from loss or damage. Use with or without the original plastic Ziploc bag. 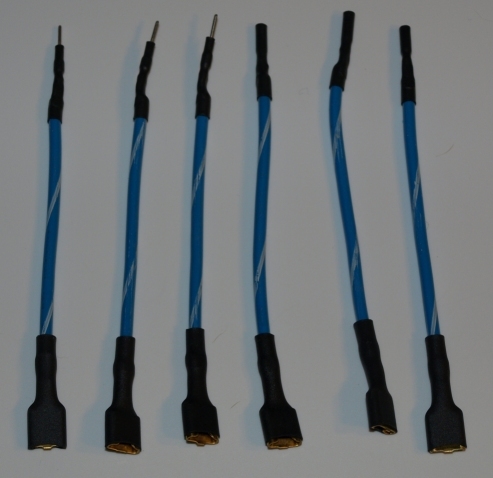 We now have a few kits available for the Deutsch Common Contact series of connectors! Production of this kit is being ramped up. Order your kit here. We are looking for feedback on this new kit. You can write a review from the product page, or send us an email from the contact page. Many of our customers have expressed an interest in Deutsch Jumper Wires, so we're building a kit to offer a few of them! There will be 2 each male and female contacts of size 20, 16 and 12. We're also going to include some 5 ft banana plug wires to help connect the Jumper Wires to your meter or test equipment! These contacts are used in various connectors found on construction and agricultural vehicles, recreational vehicles, trucks, and motorcycles to name a few. More information to follow soon. We will have a few kits in stock shortly, and will be accepting pre-production orders too. All kits now ship with the Micro 64 terminals! Production beat the marketing guys! The updated kits are in stock! Click here to go to the product page. The individual Micro 64 wires are also in stock. You can order them in a pack of 6 containing 3 Male and 3 Female. You'll also receive an updated legend card to put in your current kit. Our marketing group is still working on the formal announcement that will be going out with the coupon code so existing customers will have a chance to buy an updated kit at the same price as the current kit, so watch for the announcement! If you register on the site here, you will be notified via email with the coupon code. You can also send us an email at orders@Jumperkits.com. If we can verify that you have bought the kit in the past, we will send you the coupon code and you will receive the $5 per kit discount! Parts are in and wires with the Micro 64 terminals are being made! We have a few of the current kits left to sell, and when they are gone, all new kits will contain the Micro 64's. Our marketing group is working on the formal announcement that will be going out. There will be a coupon code so existing customers will have a chance to buy an updated kit at the same price as the current kit, so watch for the announcement! If you register on the site here, you will be notified via our email newsletter when the new kits with the Micro 64 wires and individual Micro 64 wires are available.